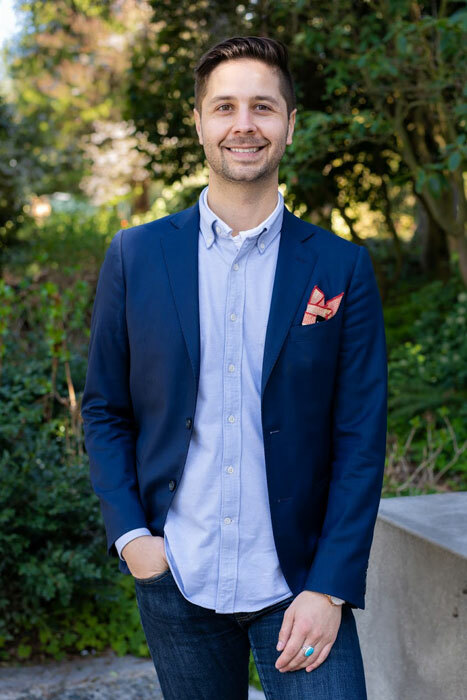 Courtesy photo: Zachary DeWolf is Seattle School Board member representing SPS District 5 and former president of the Capitol Hill Community Council. The District 3 candidate said the urgency around the issues facing the city’s most vulnerable populations compelled him to run. His focus will be addressing the ongoing homelessness crisis, displacement prevention, safe and reliable transportation that includes infrastructure improvements for all modalities, racial and gender justice, and enhancing public safety by improving public spaces. DeWolf lives with his husband, Derek, in the Central District. He was raised in Spokane, and moved to Capitol Hill in 2012, joining the neighborhood community council, which successfully pushed for a city renters commission and continues advocating for a safe consumption space for those in addiction. The candidate is a program manager at All Home King County, a nonprofit focused on ending homelessness that conducts the annual one-night count of the county’s unsheltered population. DeWolf said homelessness is a multifaceted problem, impacted by economics and racial and gender justice. There will need to be a tough conversation about increasing revenue to address homelessness, he said, but did not suggest potential new sources. “I don’t necessarily feel people are paying their fair share, but that’s not really controversial,” DeWolf said. The District 3 candidate said he’s passionate about diversion, which uses cost-effective methods to quickly secure permanent or temporary housing for those at risk of homelessness or fleeing domestic violence. DeWolf will use the city’s Democracy Voucher program to finance his campaign, which means he will have to attend at least three candidate forums. He will not attend one planned by Speak Out Seattle (SOS), a group that frequently condemns homeless populations and criminalizes addiction. Unable to come out as gay while attending Western Washington University, DeWolf lost his position as a resident advisor and spent several months unhoused. In his professional life, he said he’s seen people experiencing homelessness show strength, resilience and creativity. “I wish they heard more of the stories from the people I get to work with,” DeWolf said. Eighty percent of those living in Capitol Hill are renters, and DeWolf said he was honored to work on creating a renters commission with former councilmember Tim Burgess. He said 50 percent of people in the city are rent burdened. “A lot of people who speak about these issues are coming from a place of privilege,” DeWolf said of the debate over homelessness and housing affordability. There had previously been pushes to create affordable housing in the United States, DeWolf said, up to 600,000 back in the 1970s. That was scaled back to just 10,000 in the Reagan era. He points to a lack of state and federal investment as part of the reason the city lost 60 percent of its affordable housing stock between 2010 and 2016. The Seattle City Council approved a citywide Mandatory Housing Affordability program that provides upzones in urban villages in return for creating or paying a fee to create more affordable housing units. The legislation only affects 6 percent of the city’s single-family neighborhoods. DeWolf said MHA was a great start, but the city deserves a more bold vision for the next chapter. It took about four years to get the legislation passed, he said, and that required dispelling a lot of myths about what it was and wasn’t. There are ways the city can be innovative in addressing issues surrounding displacement, DeWolf said, using Seattle nonprofit Building Changes’ rent subsidy pilot and a flexible rent subsidy program being tested in Washington, D.C., as examples. One in 10 apartments in the city are vacant, according to the Seattle Times. The City of Denver pays the difference for what low-income people can pay in rent to get them into vacant units, DeWolf said. Trump-appointed U.S. Attorney Brian Moran says he won’t allow Seattle to follow through with plans to open a safe consumption space for those in addiction, which the Capitol Hill Community Council has advocated for over the past several years. DeWolf said he understands the concern. “I think there’s so much fear and misinformation about some of these options,” he said. The District 3 candidate wants to see the city do a better job designing Seattle, and that includes improving transportation infrastructure for all modalities. SDOT recently released a revised Bike Master Plan that cuts at least 26 miles of planned bike facilities in the city over a lack of funding. DeWolf said if the city builds the infrastructure, people will use it, even if data suggests otherwise. DeWolf said he supports block-the-box legislation, if it can pass. The Washington Legislature is now considering a revised bill that would allow for installing cameras and ticketing drivers blocking intersections and driving in bus lanes for cities with populations of more than 500,000. In order to attract more police officers to Seattle, Mayor Jenny Durkan is pushing a $15,000 signing bonus. While some neighborhoods want more officers on the ground, the Central District has historically been wary of law enforcement amid racial disparities in arrests, particularly involving young black men. DeWolf said the NAACP Youth Coalition is pushing for more counselors and less police, and he supports funding more counselors and mentors in Seattle schools. “The obvious answer is not always cops,” he said. There are many streetlights out in District 3, DeWolf said, and fixing these and making other improvements to a neighborhood’s environment can also be effective in promoting public safety. “Lighting has been shown to reduce crimes of opportunity,” he said. And people can report lights out and other issues through the City of Seattle’s Find It, Fix It app. The District 3 candidate said he wants to be able to provide community education about how residents can be engaged and better participate in making their neighborhoods better. Learn more about the candidate at electdewolf.com.